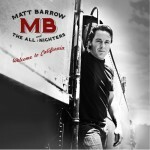 Matt Barrow And The All Nighters » MB & The All Nighters back at the 32! Home » Events » MB & The All Nighters back at the 32! MB & The All Nighters back at the 32! We are back at Ireland’s 32 for another night of raucous Roots N Roll! Special guests Wynchester will be opening so come early! !